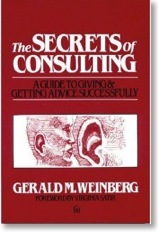 A colleague recently introduced me to a great book called “The Secrets of Consulting: A Guide to Giving and Getting Advice Successfully”, by Gerald Weinberg. I thought I’d write up my thoughts about the book. I don’t think that the book is named correctly. It would be better titled “The Secrets of Problem Solving”. That’s a more accurate title, but it’s boring and probably wouldn’t sell as many books. I can see many consultants reading this book due to the original title. However, I believe that the target audience is for anyone that needs do overall problem solving in organizations (which is everyone, isn’t it?). Weinberg assumes that most problems in organizations aren’t primarily technical ones. Rather, most problems are people-based and exist or continue to exist through people’s actions or inactions. If you ignore the people the problem won’t get fixed. Makes sense to me. 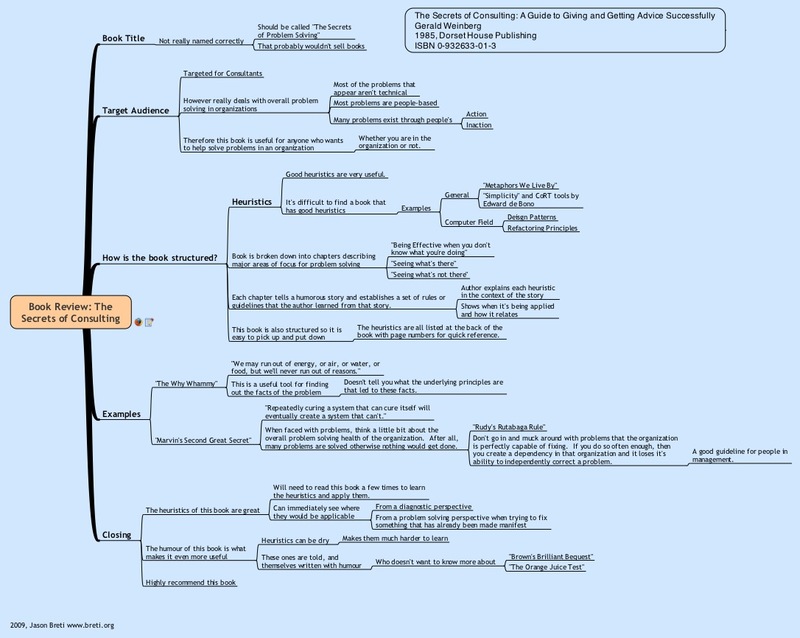 The book is broken down into several chapters describing major categories of problem solving. Chapter titles like “Being effective when you don’t know what you’re doing”, “Seeing what’s there”, and “Seeing what’s not there” give you a good idea of the content. Each chapter covers problems by telling a humorous story. It then gives a set of rules or guidelines that the author learned from that story. For me these guidelines are the best part of the book. It’s difficult to find a book that has good distilled knowledge. A reader usually has to read many books and can pull a gem or two out of each one. This book is filled with them, and you don’t have to do as much work because they’ve been generalized for you already. There are other books I know of that do this well, for example “Metaphors We Live By” and “Simplicity”. In the computer field I can also think of design patterns and refactoring principles. Books like this are rare, though. I also like how the book is structured so you can easily pick it up and put it down. Each guideline is broken up into a separate mini-section and they are all listed at the back of the book with page references. This makes the book very easy to use as a tool, rather than something you read once and put up on a shelf to dust. Here’s a couple of examples: “The Why Whammy” and “Marvin’s Second Great Secret”. “The Why Whammy” says “We may run out of energy, or air, or water, or food, but we’ll never run out of reasons.” There is a lot in this one sentence. Apply this guideline when you are trying to figure out “why” a problem is occurring. While it is true that asking the question “why” is very useful for obtaining facts, Weinberg states that it does not give you the underlying principles that led to these facts. Due to The Why Whammy you can be asking “why” forever and continue to get more facts without getting you closer to a solution. Weinberg is not stating that you should not ask “why”, rather that you should do it judiciously and not assume that it in and of itself will solve your problem. A second guideline I like is “Marvin’s Second Great Secret” which states "Repeatedly curing a system that can cure itself will eventually create a system that can't." So before interfering with problems, think a little bit about the overall problem solving health of the organization. After all, many problems are solved in an organization already otherwise nothing would get done (that’s related to “Rudy’s Rutabaga Rule”, which I won’t cover). Weinberg is reminding us to avoid going in and meddling in problems that the organization is perfectly capable of fixing. If you do so often enough, then you create a dependency in that organization and it loses it's ability to independently correct a problem. Many executives would do well to understand this guideline. Many of the guidelines in this book are great and I think I will need to read the book a few times to learn and apply them properly. I can immediately see where many of them apply, from diagnosing an existing problem and preventing problems from occurring in the first place. The humour in this book makes it even more appealing. Guidelines can be dry and thus difficult to learn and remember. These ones are told with simple funny stories, which greatly increases their appeal. After all, who wouldn’t want to know more about “Brown’s Brilliant Bequest” or “The Orange Juice Test”? I highly recommend this book to anyone who wants to add general problem solving skills to their toolbox. 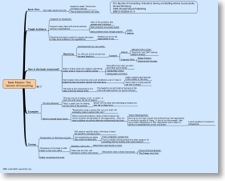 You may like to see the mindmap that was used to write the draft of this entry. Please click on the map below for a bigger picture.